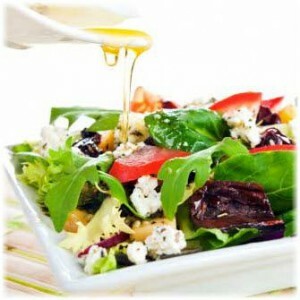 Salad dressing enriches food and turns it into a meal that will satisfy all your senses. However, it is known that in the markets can find plenty of ready-made dressings, which are usually full of unhealthy fats, salts, sugar, various artificial flavours and colours. They certainly are not recommended, and if you take care of your health, it is best to prepare them yourself - at your home. If you are a fan of a healthy diet, one way is to create your own salad dressing by combining foods and spices from your kitchen. To do this, you only need a few minutes of your time. It will enrich the dishes, but also strengthen health. Salad dressing can stand in the refrigerator for up to one week, and we give you this opportunity to prepare as much as 14 outstanding recipes. Put the chives into the blender and mix well. Then add the yogurt, basil, lemon juice, olive oil and balsamic vinegar, salt and pepper, and whisk until they are well combined with all ingredients. If desired, at the end you can add a spoonful of local honey. Yogurt salad dressing refrigerate at most for a few days. Shallots and parsley finely chop and put them in a mixing bowl. Add the mustard, balsamic, season with salt and pepper and stir well. Salad dressing can be refrigerated max for a week. Mix all ingredients until you get the desired texture. Salad dressing from red onion put in the fridge to cool before serving. Squeeze the lemon juice, finely chop the garlic, and clean spinach leaves, then wash them with parsley, and dry them with kitchen towel. Mix well all the ingredients to get a smooth paste. Tahini dressing can stay up to six days in the fridge - use it during this period. Put all ingredients in a jar with a narrow neck and shake it until the mixture thickens. Italian salad dressing can be made in a bowl as well by mixing all the ingredients until they are well combined. It can stay in the refrigerator for several weeks. In the appropriate jar put linseed, pour it with water, shake and let it stand for five minutes. Then add the lemon juice and other ingredients, and shake again until the mixture is united. This salad dressing requires certain ingredients that you may not have currently in your kitchen. Fortunately, today in health food stores all of them can be easily obtained. We recommend this great almond salad dressing. In a blender put all ingredients except salt and mix until you have a compact mixture. At the end add salt if desired or add more Sriracha-sauce. Keep the dressing in the refrigerator up to four days. In a pot pour the juice, vinegar, cumin and garlic, give it a good stir and pour over salad. Salad dressing can stand in the refrigerator for several days. Just before use shake well. Cut the avocados in half, remove the pit and scoop the meat from the peel. Mix it together with the other ingredients until you get a smooth mixture. Keep the salad dressing in the refrigerator to cool before serving. In the refrigerator, it can stand up to three days. The famous Caesar salad would not be what it is without this outstanding dressing. Find out how to make it. Preparing the dressing is very simple. It is necessary to put all the ingredients in an appropriate container and thoroughly mix it using a mixer. Dressing for the Caesar salad can also be prepared in the blender. Tomato, miso paste, lemon juice, olive oil and a pinch of salt and pepper mix until a uniform and perfectly smooth mixture is achieved. About the medicinal properties of ginger we wrote several times, and we strongly recommend that the daily diet includes this valuable root. Whatever you choose: tea, juice, syrup - you cannot go wrong. Another way you can use it is spicy salad dressing. Mix all ingredients not longer than 45 seconds. The finished salad dressing needs to cool in the refrigerator before serving. Mix peeled carrots, ginger, white and red onion, rice vinegar and oil until they unite well. At the end add salt and pepper, add tamari sauce and sesame seeds and give it a stir. Dear friends, we hope that you will choose one of the recipes and discover your favourite salad dressing. It will certainly enrich the taste of your food, it is extremely healthy and beneficial. Share this post if you liked it.